Samsung apparently has no plans to conjure up an iPhone 5S-style fingerprint scanner in the foreseeable future. According to the Korea Herald, a Samsung official said that the company is "not yet developing the technology" for its handsets, which we strongly suspect will include the Samsung Galaxy S5. Samsung does have a 10% stake in rival phone company Pantech, which has implemented fingerprint scanning technology into some of its phones, however it is believed that this technology still has some way to go to catch up with Apple. The iPhone 5S and its fingerprint scanner launched officially last week but time will tell if its security feature proves popular with buyers or end up an unused gimmick. We're pretty big fans of it though. This also means we wouldn't expect such a security feature to show up on the new flexible-screen variant of the Galaxy Note 3, which we believe could be arriving as early as next month. According to Android Community, the new Note variant, which will use Samsung's YOUM flexible display technology, will touch down in October. 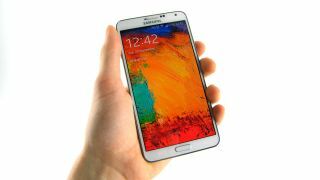 Though the device's actual name appears to be no more than speculation right now, the handset is being referred to as the Samsung Galaxy Note 3 Active.